Taskbar is an important area of navigation in an operating system. It stays visible all the time, even when you are browsing and helps you to quickly reach anywhere or lets you see an important information like battery status or clock all the time. Windows 10 like all its versions have given user to customize taskbar and choose which items appear here.Its always a good idea to choose wisely only those items in the taskbar , which are more important than others. 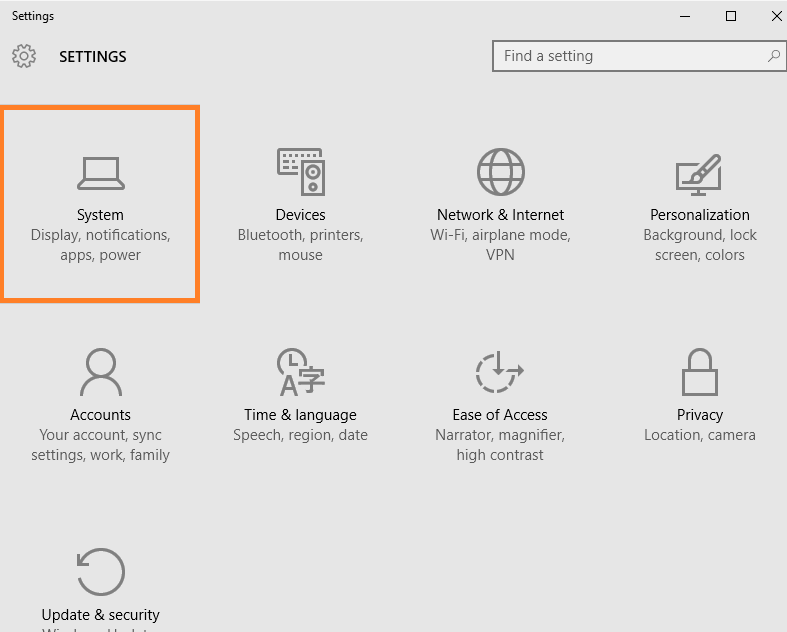 For example you will love to see clock, battery status, wi-fi and sound in the taskbar as these are the items which you use frequently. But its painful to see nvidia icon and intel smart connect icon to eat up space in your taskbar which you will never use in a decade. Step 1 – Press windows key + i to reach system panel. Step 2 – Click on Notifications & actions in the left menu, and in the right side click on Turn system Icons on or off. Now, in the next screen , turn on those items which you want and turn off those items which you probably do not use. 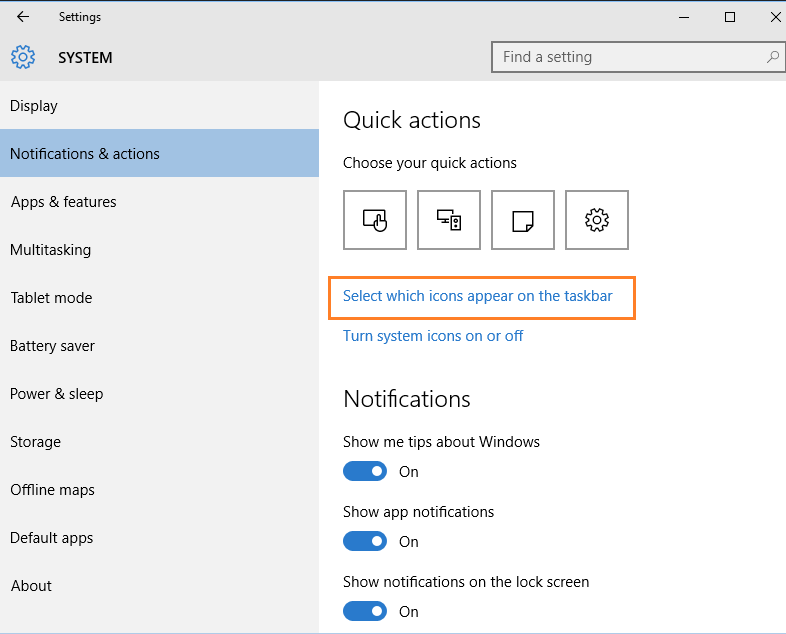 Note that if it is not visible in the horizontal taskbar, its still there in the taskbar and can be accessible only if you click the vertical arrow key in the taskbar. 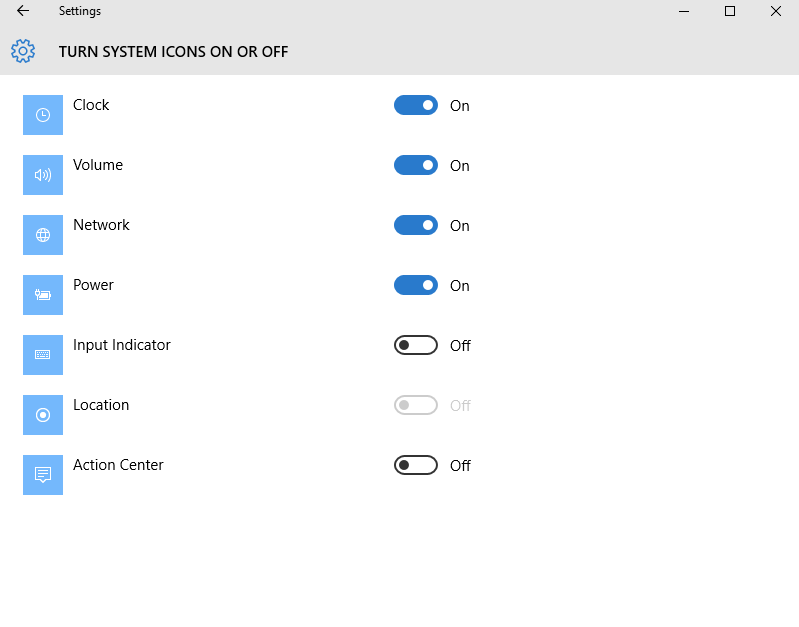 Even if the item is on and its not visible in the horizontal taskbar, you can turn it off and then turn it on again to place the icon in the horizontal taskbar. Note that these are system icons, but if you want to put any other items not in the list of system icons. Just click on select which items appear on the taskbar. Here more detailed and extensive list of icons are available for you to choose from and place on taskbar. Thats how you can customize the items which you want to place on the taskbar. Its always better to put battery status, clock and network to put on taskbar. But, the importance of a particular item also varies from person to person.